In last week’s newsletter we introduced Turlough O’Connor – High King of Ireland up to 1156. If Turlough was in the habit of reading maps back at that time, he might look at his kingdoms through the lens of this map – showing the major Tribes of Ireland at his time. Now, let’s take a brief tour (we’ll take a much longer tour in our book ) around these kingdoms and just some of the surnames associated with them. Please do leave your comments and questions at the end of this post! A Tour Around the Over-Kingdoms – The Tribes of Ireland. Turlough and his kin were from the Síol Muireadaigh tribe – one of the Tribes of Ireland at the time. Connacht became one of the dominant kingdoms on the island under Turlough. He was the first man west of the River Shannon to have the title of High King of Ireland. Turlough and his kin had taken on the surname O’Connor from this Gr,Gr,Gr Grandfather – Conchobar mac Taidg Mór who had died in 882. During his time – he annexed the kingdom of Mide and asserted control over Dublin – even then becoming the political capital of the Island. The O’Rourkes (cousins of the O’Connors) were kept under control in Breifne. To the south, in Tuamumu – the O’Briens were effectively allies of the O’Connors – as Muirchertach Ua Briain (O’Brien) had fostered Turlough as a young boy to groom him for his future position. Mac Hugh, (Mac) Egan, MacBrennan, MacHale, (Mac) Cunneen, (Mac) Conneely, Gaffney, (Mac) Conroy, MacDermot, MacDonagh, Keogh , MacManus, (Mac) Garry, (O) Boland, Coyne, (O) Cannon, (O) Cahill, (O) Keane , (O) Kelly, (O) Canavan, (O) Carney , (O) Kenny, (O) Clery, Coleman, (O) Coffey, Quigley, Conlon, (O) Conway, (O) Connelly, Conlon, (O) Cosgrave, Coogan, (O) Coolihan, (O) Curran, (O) Devlin, (O) Donnell, (O) Donlan, (O) Donohoe, (O) Duggan, (O) Dowd, Dolan, (O) Downey, (O) Fallon, Fahy, (O) Feeney, (O) Finn, Finnegan, (O), Flannery, O’Gara, (O) Glavin, (O) Hanley, O’Hara, (O)Henaghhan, (O) Hynes, (O) Horan, (O) Lavin, (O) Lynch, (O) Malley, Mannion, Molloy, Mullan, O’Mullally, Moran, Murray, Morris, (O) Ratigan, (O) Shaughnessy, (O) Tarpy, (O) Tierney, (O) Kilkelly, (O) Carney, (O) Gaughan, (O) Murphy and Mac Clancy. Note: Some of these surnames may have evolved shortly after 1150AD. Tuadh Mumhan (nowadays known as Thomond and covering the counties of Clare, Limerick, North Tipperary) become a separate Kingdom within the province of Mumhan (Munster) as the powerful tribe of the Dál gCais rose to power. 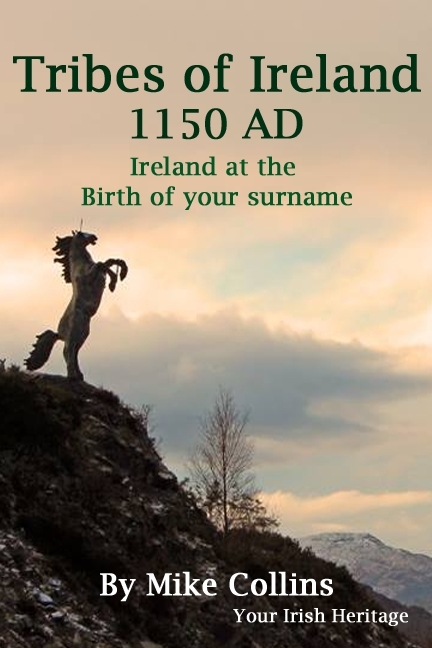 The most famous member of this tribe being Brian Boru and the first High King of Ireland in reality. The Kingdom of Desmumu (South Munster) came about in 1118 with the further rise to power of the Dal gCais tribe of north Munster. Munster was divided into Tuadmumu – ruled by the O’Briens, and Desmumu – ruled by the MacCarthy Mors (one of a number of MacCarthy tribes). The kingdom covered the modern counties of Cork, Kerry, Waterford, South Tipperary and South Limerick. Mac Auliffe, MacGillycuddy, (Mac) Cotter, (O) Canty, O) Brosnan, (O) Keefe, (O) Cahill, (O) Callaghan, Carey, (O) Coffey, (O) Coughlan, Connolly, (O) Connell, (O) Cronin, (O) Crowley, Cuddihy, (O) Cullinane, (O) Quill, (O) Collins, (O) Dorgan, (O) Dwane, (O) Donegan, (O) Donoghue, (O) Duggan, (O) Doheny, (O) Dennehy, (O) Dinneen, (O) Downey, (O) Falvey, (O) Phelan, (O) Field, (O) Flynn, Foley, Foran, Forde, (O) Garvey, Griffin, (O) Hea, (O) Hennessy, Healey, (O) Driscoll, (O) Hurley, Harrington, (O) Noonan, Green, (O) Leahy, (O) Leary, Lehane, Mannix, Mullins, (O) Mahony, (O) Meehan, (O) Moriarty, (O) Riordan, (O) Scanlan, (O) Shea, (O) Sullivan, (O) Tracy, (O) Twomey, (O) Duggan, (O) Kennedy, (O) Cagney, (O) Leary, (O) Dullea, (O) Coffey, (O) Cowhig, (O) Cullinane and (O) Driscoll. The Kingdom of Laigin (or Leinster – but it was significantly smaller than the current province of Leinster) – was ruled over by the Sil Fáelchán tribe of the Uí Cheinnselaig. Diarmait Mac Murchada (MacMurrough) was the King of Leinster at the time of Turlough. When we look back at Ireland at this time (around 1150ad), we often think of it as the “twilight years” for the Gaelic Dynasties. A few years after this, Diarmait was deposed as King and played a pivotal part in triggering the invasion of the Anglo Normans in 1169. Fitzpatrick, O’Larkin, Kavanagh, O’ Brennan, O’Cullen, O’Doran, O’Nolan, O’Ryan, FitzDermot, O’Toole, O’Byrne, O’Carey, MacKeogh, Phelan, (Mac)Breen, O’Kelly, O’Coveney, O’Carroll, O’More, O’Devoy, O’Duff, O’Dempsey, O’Tracy, O’Gorman, O’Dowling, O’Cosgrave, (O)Rafter and Murphy. Quinlan, Devine, O’Hea, O’Hennessy, O’Connolly, O’Breen, O’Higgins, Mac Geoghegan, O’Brennan, O’Hart, O’Curry, O’Daly, MacAuley, O’Dooley, O’Scully, Mulholland, MacGee, O’Donoghue, Gaffney, MacConway, O’Ronan, O’Farrell, Mac Coughlan, O’Houlihan, O’Molloy, O’Carney, Fox, O’Keary, , O’Regan, O’Casey and O’Carroll. The Uí Briúin Bréifne were the main tribe within Breifne (appropriated meaning “Hilly” as it covered the modern counties of Leitrim, Cavan and parts of Sligo). Brady, McCabe, Gaffney, MacDonnell, (Mac) Clancy, MacGowan, (Mac) Elroy, MacEnroe, MacManus, (Mac) Murray, (Mac) Shanly, MacSharry, (Mac) Tiernan, MacGovern, Maguire, O’Banan, (O) Boylan, Cassidy, (O) Kenny, (O) Carroll, (O) Carolan, (O) Connolly, (O) Corcoran, (O) Corrigan, (O) Farrelly , (O) Finnegan, (O) Heany , (O) Muldoon and the second leading family – the O Reillys. Airgialla (later also known as Oriel in English and covering Counties Armagh, Louth and Monaghan) was an unusual case – it was really a federation of smaller kingdoms rather than a kin group. The Kingship rotated among the various tribes and at the time of Turlough was held by Donnchadh Ua Cearbaill (O’Carroll). Mac Cann, MacArdle, MacCasey, MacNally, MacConville, (Mac) Crilly, (Mac) Cullen, (Mac) Loy, (Mac) Gillespie, Mac Mahon, (Mac) Quaid/Wade, (Mac) Scanlan, (O) Callan, (O) Keenan, (O) Cosgrave, (O) Crehan, (O) Lynn, (O) Finn, (O) Flanagan, (O) Garvey, (O) Hanlon , (O) Hare, (O) Sherry, Fagan, (O) Rogan, (O) Creehan, (O) hAedha, (O) Keelaghan and Traynor. The Northen Ui Neill (not to be confused with the surname O’Neill) was a kin group who were descended from Niall of the Nine Hostages – legend was that his sons Eoghan, Conall and Enda moved into modern county Donegal in the 5th century. From these individuals came the tribes of Cenél Eóghain and Cenél Conaill who established themselves as lords in northwestern Ulster. Over time, the Cenél Eóghain gained prominence and they expanded into what are modern counties Derry and Tyrone. By the time of Turlough, the leading family of the Cenél Eóghain, were the Mac Lochlainn (McLoughlin) – but they dominated the Northern Ui Neill alongside the the O’Donnells and O’Doherty’s of the Cenél Conaill. McCluskey, Kearney, MacNamee, MacGee, Mac Guigan, (O) Breslin, (O) Bradley, (O) Carolan, (O) Cannon, (O) Kane, (O) Colgan, (O) Crean, (O) Quinn , (O) Donnelly, (O) Farren, (O) Ferry, (O) Flanagan , (O) Gormley, (O) Gallagher, (O) Hamill, (O) Hegarty, (O)Hoban, Hunt, (O) Lunney , (O) Mellan, (O) Murphy, (O) Neill, (O) Peyton, (O) Scully, (O) Muldorey, (O) Boyle, (Mac) Ward, (Mac) Kelvy, MacGonigle, MacCusker, (Mac) Daid, (Mac) Caffrey, (Mac) Garvey, MacBride, (Mac) Cole, Coyle, MacIlhoyle, Gilmartin, Mac Loughlin, MacGrath, MacRory, MacSweeny, (O) Boyle, Begley, (O) Corr, Coonee, (O) Doohan, (O) Duffy, (O) Friel, (O) Laverty, (O) Hagan, (O) Harkin, (O) Mulligan, (O) and Muldory. MacAteer, MacNiece, MacCartan, (Mac) Carroll, Mac Donnell, (O)Colter, Dunleavy, Greene, Magennis, Kenny, MacKenna, (O) Flynn, (O) Flattery, Hughes, Haughey, Lavery , (O) Long, Miller and Rooney. And that’s it for our mini-Tour around the Kingdoms of Ireland around 1150AD – a time when Irish surnames still coming to the fore. And just before a time when Ireland was to change forever, with the invasion of the Normans. Do you have a Norman Surname in your family tree? Click here to discover more about Norman Surnames and how they evolved. Please feel free to leave your comments and questions below! Mike. Thanks for sharing Patricia – and you vote of confidence! All the best, Mike. I have tried to search for my surnames but can find nothing and most of the links did not work. My great grandfather was born June 16th 1842 and I do not know where but the family always believed it was Ireland.’His name was Henry Osborne . There was another Osborne living in Gagetown, New Brunswick Canada in our 1871 Census when I also find Henry there married to Elizabeth Norwood whose father was John Norwood born 1831 in Belfast. I have reason to believe Henry may have come as a child in 1847-51 era. The other Osborne was James Osborne whose wife was Sarah both coming from Ireland. There ars many interesting posts here dating back a few years and there’s a lot to trawl through. Is there a chance that some kind of search feature could be added to make searching for relevant posts easier? You could then put key words, which for me would be Kennedy and Tipperary and see only info containing the key words. Many thanks. im still trying to find out if my surname farrelly has come from scandanavia.i remember spelling the name in irish at school,which is fhaircheallaigh.im curious.thanks.patrick.great page.great history.thanks. Thanks for your feedback Patrick – much appreciated. On Farrelly and the “Scandinavian” connections – Farrelly comes from an Irish name that relates back to the Irish first name “Feargal”, which I don’t think isScandinavian in origin. It is from the Irish Ó Fairghaile – and is typically found in the area the name originated – County Cavan (Breifne on our map) – and also in County Meath. All the best, Mike. actually came from Scotland , they (some ) left for Ireland way back before they became a tribe? Any thoughts on that please mike? It is my maiden name although we did not use the `O`. Fhaircheallaigh is the lenited version for a woman’s family name, such as Ni (daughter of the grandson of) Fhairchealaigh for an unmarried woman. Males are O Fairchellaigh. The O’Farrellys were associated with Drumlane Abbey, Co Cavan, as abbots and earlarbs about a thousand years ago, and moved later to the southeast corner of Co. Cavan. The O (grandson of) was present in the 18th Century but dropped in the 19th. My paternal family came from Mullagh, Co Cavan. Also, search for Agnes O’Farrelly, 1874-1951, born near Virginia, Co Cavan. I believe some Farrellys also came from Co Longford. I am trying to locate where the LOWRY’s would be at. Thank you. Hi Scott – when found in Ireland, Lowry can be a Scottish planter name. But it can also be a variant on the Gaelic name Lavery – found in Ulster. Mike. It could be that you are descended from Labraid(pronounced Lowra) of the O’neils (Labraid Lámh Dhearg). Descendants used the name Labhradha(Pronounced Lowra), so Ui Labhradha then O’ Labhradha. Derived names include Clowry, Lavery, Lowry. They were part of the O’Neil clan so anywhere in the Southern Ui Neill or Northern Ui Neill lands. My family are from the south and always said we weren’t from Ulster. Not all Lowry surnames are derived from Ulster plantations despite what wikipedia says. My ancestors were Kanes too. As well as Glennon, Gallagher, O’Donnell and many others from Ireland. I was wondering if you have an account on ancestry.com? I’d love to see if our family lines cross at all. You could also email me if you like at erynsmom03@gmail.com. All great Donegal/Derry/Antrim names Crystal. Good luck with your search! Mike. Hi Mike, first of all…congratulations ! you have indeed put in many hours of work to educate us…thank you. Maybe i am a little slow, but where does the name BURKE come in please?? I have been trying to find the name Fitzsimmons , Lawlyes, and Carrigan, all my heritage names…..and am could use some help..didnt’ see any under the tribes. Mike I’m not sure how to make a new comment. Anyway, my maiden name is Evoy. My uncle had traced the name to the Evoy Forge in or around Wexford. Would this be connected to the name O’Devoy? I’m not familiar with the old names. Would love to trace it back! We were also told there was never a Mc or Mac in front. Hi Lynn – there is a map at the top of this post. Let me know if you are having trouble seeing it and I’ll email you on a copy. All the best – Mike. Amazed to see how a couple of my surnames; Cahill & McMahon for instance are found in multiple Kingdoms, no wonder I am having a hard time tracking them! Hi Anne – thats the way with these 2 names! Let us know how you are getting on – all the best, Mike. I’m like Ann – I see Flanagan in a couple of places, so not sure where to start. Also, from what I know of my great-grandfather John Flanagan…he emigrated to USA from Cork, and I don’t really see the family name there too much. I can’t wait for this book either! Hi Kathleen – yep its a name that sprang up in a few places in Ireland – the most numerous/powerful being in Roscommon. Flanagan would be quite a rare name in the south/Cork – a lot of individuals emigrated from Cork through Queenstown/Cobh – but came from other parts of the country. I know my own relatives emigrated from Conaught through Cork – is this possibe for yours also? All the best, Mike. How wonderful to finally see one of my family name, Fennessy (O’Fennessy), in one of your pieces. Our own research, started by a great aunt, has found the spelling O’Fiangusa also, and indicates a purely Munster origin. We have traced our line to a gentleman named Richard Fennessy who “operated a nursery in Ballynatin, Co. Tipperary.” He deceased in 1747. Keep up the great work. God bless. Hi Pamela – thanks for sharing. The name Fennessy was originally (at the time this post is set) from the Cashel area of Tipperary. Over time they also moved further south into the Waterford area. All the best, Mike. Hi Mike, I have 2 names that are hard to find, Calderwood & Loy, Francis Calderwood married Margaret Loy, left County Tyrone abt. 1835, for Cumbria, they show in the 1841 census of Cumbria. It is only on a later census that they say Tyrone. I have found some mention of Calderwood in Tyrone, Antrim but haven’t found my Francis. As for Loy I haven’t found any mention of a family, but there is a school, hill etc. named in the area of Dungannon, Tyrone. Any help appreciated. Hi Louise – firstly as you probably realise, this page focuses on the Gaelic names in Ireland up to 1150. Now lets help you out – Calderwood is a Scottish planter name found in Ireland after the 1600s – most likely in Ulster (although I used to live opposite Calderwood Estate in County Cork). Loy on the other hand is from the Gaelic Mac Lughaidh – a name from Airgialla above. And now I’ve modified the names to include your name MacLoy. If you want to track individuals – I suggest you contact Noreen at http://www.facebook.com/Hiberniaroots (tell her I sent you) and she should point you in the right direction. I, too, descended from Flanagans. Mine came from Roscommon, but also maybe from other places originally. Looking forward to book. Hi Pat – thats right – but all the different Flanagans would be from different lineages. The Flanagans of Roscommon/Connaught would be the most powerful family line. Mike. So much fun to see my surname, Lehane (Lyons) listed and some history! Thank You! You’re welcome Marilyn 🙂 Mike. I see Harrington but not Cotter. Does that mean that Cotter did not exist as a surname at that time? Hi Sheila – its there all right under Mac Cotter in Desmumu. All the best, Mike. Thank you! I see my Boyle ( O Boyle) name and also McLaughlin, a Scottish family name for generations that our family genealogists always suspected originated in Ireland. You’re welcome Rosemary! On the “McLaughlin” of Midhe – watch out for that one as it comes from the Irish “Mac Giolla Seachloinn” which literally translates into Mac Glaughlin which often transposes to McLoughlin/McLaughlin. So, while this might be a lead for you – it is not the definite “truth”. But stay tuned and in touch – lets see how things develop. Mike. Thanks for the posting. Finally am seeing one of my ancestral names- Doud (Dowd) in your posting. Keep up the good work. Looking forward to your book next month. Great respect shown there Joan 😉 – actually Hamill is from the Irish Ó hÁdhmaill (O Hammill) and was a name from the Northern Ui Neill (but moved further east over time into Armagh and Monaghan). And now I” add it to the post above. Now aren’t you glad you asked! All the best, Mike. I think we’re all a bit more Irish than we think 😉 – and thanks for the feedback Joan. Mike. Because of this need most Irish Ó hÁdhmaill’s, changed to Hamill, some changed to Hammill, some to Hamillton, etc. * Some Scottish Hamill’s are of Norman origin and are named after a location; Haineville or Henneville in Manche, France. Which itself was named from the Germanic personal name Hagano and the Old French ville for ‘settlement’. * The English Hamill’s of Saxon origin are named after a nickname from Middle English, and the Old English “hamel”. * The English/Scottish Hamilton’s are named after a location; the village of Hamilton, Leicestershire, England. I have Kelly & Wallace that I have only been able to trace to Galway (Tuam) in the late 1800’s. So many Patrick’s & Mary’s roaming around in Ireland. I also have a Murphy line that I really haven’t delved into past the immigration to Canada. Looking forward to seeing your book. Will it be available for Kindle type devices? Hi Michelle – yep, lots of Patrick and Marys! The book will initially be for both Kindle and as PDF download. All the best, Mike. I see the MacCorcoran surname originated in Tuadmumu and the O’Corcoran surname in Breifne. Any idea what the distinction would have been between the two surnames (Mac and O’)? Keep doing this terrific work, Mike! Hi Judy – Corcoran would be from the first name derived from the nickname “Purple”. In this case – the Macs and the Os were seperate lineages. One (the Os) were named after grandfather – the other – the Macs were named after a father. Thats the general distinction between O and Mac. All the best – and thanskf ro the feedback, Mike. Just love this site & was pleased to see the sir name of Sexton listed; but am still looking for info to sir name for Cadwallader. Thank you. Thanks for the nice words Kay – on Cadwallader – thats a later Norman/Welsh name – introduced into Ireland after the time we are covering above. I don’t realy have much info on where this name was in quantity in Ireland. How much do you know already? All the best – Mike. Thats a fine mixture of Munster counties Maribeth 🙂 Mike. Hi Janice – Hayes came from an number of Irish locations – but most likely from Munster (can also be Donegal, Mayo, Meath, Wexford, Monaghan, Tyrone) as it comes from a popular first name Aodh. Wade can be an English planter name OR in Airgialla on the map can be a version of the name MacQuaid. Hope this helps, Mike. And it should be! Tamara – they were a family of Breifne on the map (modern Cavan and Leitrim) – and I am amending to include. All the best – Mike. Hi Larry – Cullen can be either MacCullen from Airgialla (Monaghan) or O Cullen from Kildare/Wexford/Wicklow (Laighin). I’ll put them into the post. On Cole – Thia can either be an English Planter name or Mac Cole – from the Northern Ui Neill (Donegal). I’ll stick that in too! Mike. This is amazing research Mike! My grandparents were Coll’s and Boyle’s from Donegal. I am always looking for more information! Hi Mike– I am only beginningto look into my Irish ancestry. My grandfather, Matt Crilly, came from Drogheda, Co Louth. I was told the Gaelic name was MacRaghallaighl and possibly from Co Down or came from Scotland? Would you know anything about that name? Hi Clare – it comes from Airgialla in our map above – so south Down would be about right. I’ll include it in our post. Also – have you seen Fr. Ted – featuring none other than Father Ted Crilly! All the best, Mike. I’m descended from Carroll, Cleary, Higgins and MacSharry (and a Pugh and Jinks which I know is English and Welsh descent). So much fun to see these names in your list!! Thanks Michael!! Your hard work is greatly appreciated!! Hi Kathy – thanks for sharing and letting us know! All the best, Mike. I am looking for my grandparents tribes. Grand father (O’) Driscoll, Cork and grandmother Fitzgibbons or Gibbons, Tipperary. Hi Joan – the O’Driscolls are listed above in Tuadmumu (were the chiefs of the Corca Laoidhe on the map). The Fitzgibbons aren’t featured here as they turned up later – they were a Norman family. When did the FitzGibbons, Gibbons, dynasty begin to exist? Hello, Linda Irish here again. I have been following along and do enjoy your information. I have been wondering if there will ever be any items in your store with the surname Irish on them and will the Irish surname be on any maps or in your book? Hi Linda – Irish is one of those surnames (like Scott, Ireland, Walsh, Fleming) that people in another country/territory give to someone who cam from the place – like Ireland! How nice to have a name like Irish (its even in our name “Your Irish Heritage”). Firstly – I will put the name into the shop and let you know when its there (we do that only when people ask) – secondly, the surname Irish comes from the Kilkenny area – given to returning emigrants from e.g. England – who returned to Ireland having been given their nickname over there. So you won’t see it on the map for 1150 – but we will see what we can doe for later maps! All the best – Mike. Am looking for Samuel McKee from Antrim, but not sure if city or county … any suggestions??? Hi Rita – McKee is typically a Scottish planter name – prevalent in Ulster after 1600. It is a version of the Scottish McKay. Spread all over Antrim. All the best, Mike. I’m betting “(O) Creehan” was a forerunner to Crahan/Crehan. I’ll have to tell my Mom about this. Have a few questions on my Heffernan/ Giblin-Hunt/McKelvey ancestry: I see my Mom’s Heffernan, but no Giblin – whom I thought were around the now Roscommon area by this time. PS: sorry for being so long-winded, but I also wanted to mention that I was so very pleased with my T-shirt purchases!!! I am proudly wearing my Ó Fiachna (told my daughter I’m changing my name back! ); and my 13 year old granddaughter is proudly rocking her Mac Cába (which may become the name of her future band!). Many blessings to you and Carina – for all the kindness and knowledge you bring to us! Hi Virginia – right, I can see you’re testing me! 😉 – Giblin needs to be in there (probably under the Uí Maine of Roscommon). Fiachna were of the Northern Uí Néill (Tyrone). And McKelvy would have been of the Northern Uí Néill also (Donegal). Must add that too. Great to hear you’re all enjoying the tees! All the best – Mike. Thanks Mike! Just checking with my favorite teacher to see how much knowledge I have retained from your lessons!! Mike, this is so informative and your research is very extensive! Since I don’t see my Mannix/O’Mainchin here (unless I missed it), does that mean my ancestors were not in Ireland yet in 1150 AD? Thanks! They were indeed there at that time – in the Corca Laoidhe tribe of west Cork. I’ll modify the article – thanks for pointing it out! All the best – Mike. Ah, yes, I see my Mannix now under Desmumu, thank you! This is all very interesting. My husband and I just got back from our first trip to Ireland and absolutely LOVED every minute of it! I asked around a little bit about my maiden name, Mayes, which I have been told is Irish but no one could pinpoint a place of origin for me. I have no county information passed down through the family. Only the statement that we are Irish, and possibly Dutch-Irish according to one aunt. After we got back I saw a picture of Mayes Pub online in Dublin and can’t believe I was on the same street and missed it! Can you help with the surname Mayes? Our family is said to have come to Virgina first when immigrating. Hi Marcey – sounds great – I’m glad to hear that you had such a great time! Mayes is an interesting one – here goes: It is originally an English name – but is also linked with the other English surname May – which in Ireland sometimes stands in for the Irish name Mac Máighe – which is a Gaelic name eventually used by some of the Norman family of Condon. Hope this helps – and I’ll keep an eye out for more definite “possibilities”. All the best – Mike. The search for names can be very difficult. I’ve found my McAuley where I though they would be. However, I’m beginning to think that my Simpson, Warnock and Barclay are originally Scottish, then Irish, then Scottish again. I bet these ancestors never knew that hundreds of years later anyone would care. Aah, if I could just have five minutes with a few of them!!! Sigh! Well put Ann – and thanks for sharing! Mike. My Hogans and Mullallys are still in the same place since ancient times. Went to visit them three years ago still on their ancestral lands. They survived the many English tyrannies due to their profession of farriers. Can’t wait to read the book also. Hi Daniel – thanks for sharing (and your support!). Isn’t it great when people stay in the one ancestral land for so long! All the best, Mike. MacLysaght says that Mac Daibheid/MacDaid/MacDevitt/Davitt/Cavey descend from David O’Doherty who died in 1208. A bit too late for your 1150 date? Thats the way Kay – different surnames were still forming for hundreds of years after as branches of kin split off – and later some Norman families assumed Irish names. But you raise a good point – and I have decided to include names that were solidly linked to the kingdoms/clans of the time. Mike. Hi Mike and Carina: …. your weekly headache here again! Am truly enjoying myself but just when I think I start to learn something there’s a zillion more things to learn about Ireland. A “fix” for my life long passion. I admit that I haven’t studied this writing too closely, yet – but any help will be appreciated. I can’t say I know where in Donegal my father’s dad came from but his mother, Dunleavy, was from Ballina. From everything I’ve learned, her family didn’t move around all that much – mostly County Mayo. Can you help point me to them in the these tribes? My Mom’s Irish connection is just as strong but I have hardly any information. Gillespie from Armagh and Murphy from maybe Roscommon? Oh well, I’ll settle for any help at all. Hi Kathi – the Dunleavys were in Ulidh in my map – where they were the royals! Shortly after they went west to Donegal – and then down to Connaught – where your story picks up. Gillespie were, I think in the Airgialla (Armagh) – so I’ll add them to the post. Murphy were a few different tribes around Ireland – one of the groups were the Connaught Murphys in Roscommon – I’ll add thos also. All the best, Mike. Our Patterson family came from a small village called Ballypitmaeve in Atrim, which I understand is no longer there. They were farmers. Thanks for sharing Colleen – the Patterson name would have arrived in those parts a few hundred years after the time (1150) we are looking at. Ahh – the shifting sands of time! Mike. Hi Bettie – Conaty is a version of Connaghty (Ó Connachtaigh) from County Cavan. That would be part of Breifne in the map above. All the best – Mike. Hello again, I will wait patiently for more info on the Irish surname. In the mean time my mother’s side of the family is Henaughan which I hear is from County Mayo. Any tidbits on them? Hi Linda – I already answered your first question – see further down this page. Henaughan? Sounds like it should be Henaghan – from the Irish Ó hÉineacháin – Connaught – Mayo – the Uí Fiachrach tribe. Mike. Hi Mike I have several lines in Ireland. Sullivan, Fitzgerald’s from Kerry. Patrick’s and Mary. What a joy!! Foley from Cork. I always see these but also have Loughran from Tyrone, Mackle from possibly Antrim and Morrow from ?? That I don’t see. Also does Fitzgerald and possibly other Fitz’s follow the Fitzpatrick’s info? Hi Mary – the Morrows can be an English planter name OR it can be from the MacMorrows – a family from Breifne in the map. (Leitrim). Fitzgeralds were one of the main Norman families to appear in Ireland after the Norman invasion. But that is later than this map depicts. Mike. The Morrows were a Scottish planter family Mr. Collins, certainly not English. DNA testing has proven this. There were no Morrows ever recorded as coming from England to Ulster during the plantation. I’ve also heard claims that they were French Huguenots, which is also wrong. As I have trawled through more than 5 volumes of “The Huguenots in Ireland” and not a single Morrow or anything similar sounding was ever mentioned. The Morrows were recorded as one of the principal families of Lanrick (Lanark), five Scottish Morrows were shipped to the Virginia colony in 1651 after being captured by Oliver Cromwell after the battle of Worcester. DNA testing has confirmed that Morrows can be of two origins: Gaelic stock from the name MacMurchadha or MacMuireadhaigh, OR from Murray because the name Murray in the Lowlands is pronounced as “Morrow” or “Murrow”. A “John Morrow” was recorded in the late 15th Century in Selkirk as being a “chief of a Clan with 500 men at his back”. He went under the names John Murray and John Morrow throughout his life. There were many Morrows recorded as coming from Scotland to Ulster during the plantation. For example: in 1606, Captain Morrow and David Morrow were recorded as settling in North Down around Killyleagh, having come from Ayrshire. William Morrow and Thomas Morrow are an example of two coming over with the official plantation scheme, Morrow can be a Scottish or an Irish name, and it’s sickening to see people call the name English as that proves a heinous lack of research. Unfortunately too many people pay attention to MacLysaght for Irish surname origins, whereas they should broaden their references to people such as the great O’Hart and Padráig Mac Giolla Domhnaigh. The Morrows who came to Ulster became Ulster-Scots or Scotch-Irish and were part of the great exodus to the American colonies in the 1720s, and many great Morrows in America were the ancestors of Scotch-Irish and Scottish immigrant Morrows. Examples include Dwight Morrow, Jeremiah Morrow, Thomas Z. Morrow and Maj. Samuel Morrow. Thanks for the thought and wishes Patricia! Mike. Hi Elizabeth – you’re right about Linskey – its from the Irish Ó Loinscigh which is also similar to the Irish for Lynch. On Huroisk – I don’t recognise this name at all. I wonder is it a mispelling or variant? You might be looking for the Irish name Ó hUaruisce which translates to Houriskey or Horish. Mike. Thanks for sharing Elizabeth – Houriskey is typically County Tyrone. Mike. Mike, thank you for sharing all this wonderful information! I notice tha the name “Carroll” appears within several of the tribes. Would you please explain why this is? Hi Jan – you’re welcome. The reason you often see a family name happen in many areas is because it was based on a first name that was popular in many parts of the country. A first name such as “Cearbhaill”. Mike. Thank you for the time you have given to our family heritage!! My family are the Hedigan’s from Galbally who owned the family Victuallers & Butchery …the Hedigan’s also have the Brian Boru pub in Dublin which has been in our family for over 200 years, I had heard they were from the Vikings!!! could you give me more info on them and I also saw from my grans side the Roche family were royals… So where did the originate from? Hi Alana – you’re welcome! Interesting story about your Hedigans – but I think they were from Clare in the really early days. Roches were a Norman family (so won’t be on our map above). They moved into the area around Fermoy in County Cork (displacing the O’Keefes and others) – and are still much around the Cork area. Mike. Mike, I thank you for all the hard work you do! Its a tremendous help to see where the family names come from so long ago. My family names are , Murray – Barry-Gaffney and maybe Collins. In the 1850’s they were around County Meath. Then around 1880 +- they went to U.K then off to Boston. Before 1854 I have no real proof of where they came from. Hi Patrick – thanks for the feedback. Thats a great collection of names you have there. SOunds like many of them moved towards Meath over time as most of these names are originally from other counties. All the best – Mike. Found my Quinn name on Donegal. That’s what I had been told before. Others said Tyrone. I think I’ll just go with Donegal. Thanks so much. Love the Newsletter !! Thanks for the feedback Genie – There are several seperate Quinn tribes around Ireland, but the northern Quinns are typically from the Northern Ui Neill and from Tyrone – just a hop from Donegal! Mike. Hi Mary – thanks for your feedback! Yep – you are spot on about the Foleys – and thansk for all your support! Mike. My cousin has been able to visit Ireland several time and do a lot of research on our surname Knee . here are a few emails that we have sent each other. Thought you might find them interesting. 610 from the MacGregor Clan of Scotland. Inis Ní always seemed elusive to me. I had often passed the seductive signpost for the island after coming over the vast and empty Roundstone bog. Just when you think you’ve found the wildest coast in Connemara, there is Inis Ní, stretching further into the sea. The island’s new looped walking trail seemed a good excuse to finally explore it. On a grey April day the cone of nearby Cashel Hill had emerged from the mist to dominate this bogscape. But slowly the sun came out and dissolved the cloud, revealing the Twelve Bens, which dwarfed everything. You can see why this mountain range is iconic: their clustered, alpine profile pierces the skyline from north Connemara right down to the Burren. Inis Ní is one of the most northerly outposts of the south Connemara Gaeltacht. But in Listening to the Wind , the first of his Connemara trilogy of books, Tim Robinson says use of the language has declined to the point that it is no longer a bona fide Irish-speaking community. The island’s name, he says, might relate to the surname Ó Niadh. The trail followed a quiet road past granite walls caked in lichen and moss, old peatland inundated by the tides, and patches of earth blackened by the burning of gorse. There were signs of modern Ireland too, like obtrusive bungalows and unfinished buildings, but the deeper into Inis Ní you go the further you feel from 21st century Ireland. The trail runs down the west side of the island, looking over the water to sandy Gorteen Bay, Errisbeg Hill and the village of Roundstone. According to Tim Robinson, the island’s tradition says local landlord Patrick Blake evicted what few tenants remained after the famine and turned Inis Ní into a sheep ranch. This was before the first bridge was built, when the island could only be reached by scrambling across rocks at low tide. But when the ranch failed, Blake brought new settlers in from nearby Carna. I walked down to a pier overlooking Roundstone Bay, and stopped to explore the tidepools. These habitats are our own miniature coral reefs, rich in biodiversity. In one I counted beadlet anemones, polychaete worms, a rock goby, tiny crustaceans, limpets, dog whelks, and algae and lichens. The sun was out, the scent of gorse filled the air and cattle dozed on the grass. I left the marked trail and took a cul-de-sac towards the island’s barren southern tip, where a cacophony of birdsong emanated from the heath. I made my way back to the marked route past the ruined chapel of St Mathias, another small harbour, and back towards mainland Connemara. Map: OSI Discovery Series Sheet 44 or Tim Robinson’s map of Connemara published by Folding Landscapes. Trail map at irishtrails.ie. Suitability: Easy. Minor roads and tracks. Start and finish: The turn for Inis Ní/Inishnee is off the R341 2km north-east of Roundstone. Cross the bridge and the trailhead is on your left. Distance and time: 6km,two hours. My extension added an extra 3km. main Cincinnati (OH) Library’s Genealogical Section here in Cincinnati, OH. It is O’NIADH cousin! This is O’Knee is southern Ireland and O’Neill in northern. Celtic vrs Gaelic. It means “descendant of the hero”. Hi Linda – thanks very much for sharing – I have also sent you a private email on some items in your post. Mike. Not a McConaghie or a McQueston in the lot. Not yet Nancy – how about you tell us what you know? Mike. I was wondering if you had any information on Broderick (O’Bruadair). Is it Viking or Gaelic in origination? A bit of both Joe – the name comes from a Norse first name – so there is probably a lot of mixed Gaelic and Viking blood in the family! mike. Very interested to see the Lynch’s came from Connaught. My Father always told me his grandfather was Irish and he believed him to be born in Mullingar. However he did say that this grandfather was married twice, one in Eire and once in Limavaddy in the North. It has been very difficult trying to work back to find out about the Lynch’s as it seems my grandfather was named John Lynch and his father was also John Lynch. I’ll keep on trying. My parents took my brother and I to Ireland back in 1970 and I very much loved the country. I hope to return there one day. Hi Jackie – Lynch is one of those Irish names that sprang up in many parts of the island. It can also be of later Norman origin. That can make it quite difficult to track down! Mike. Thank you for your work. I’m still trying to find my gggrandfather Timothy Mulcahy-aobrn around 1799-1798- don’t know when he arrived in America but owned land by 1834 in Kentucky. DNA-we are in L-21 project for Family Tree DNA. Still working on subgroups- project for Eogonauts, Sullivans and two Mulcahys. Going to take Geno 2. DNA and then possibly the Brittian Chromo 2. test. A very long time looking-about 30 years. Still searching. I know we have family in Ireland and want to meet them before I leave this earth. Your work is just facinating and adds so much to what I have already accumulated. Can you relate again your findings of the Mulcahys?? Hi Marcia – thanks for sharing and the feedback. I’m sure if you have spent 30 years search you know a lot more about the Mulcahys than I do! Usually found in North Munster – Tipperary. I’ll add it to our watchlist and lets see what comes up! Mike. When did the Tobins’ come in to Ireland? The oldest ancestor we have found is Moses Tobin was 1700’s and his son Martin Tobin 1784. Martin came to US or Cornwall Canaday area. He married Elizabeth Isabella McDonald from Scotland who was born in 1786. Moses Tobins wife was Mary Lyster born 1766 approx. That is all we know about him. We are trying to find out more about the Tobin history. Thanks so much – love the site – lots of info. Our family is doing the genealogy search. Thanks! Any help would be great. Hi Lynn – thanks for the feedback. Tobin was a Norman name (originally St Aubyn) that came to Ireland after the 12th century. They mostly settled in the Kilkenny and Tipperary areas. Mike. Hi Mike, I was able to find my ggrandmothers naturalization papers online. She listed my ggrandfather as being from Donegal. The last name is “Fox” (b. 1863) Is that a common name for that area? Hi Anne Marie – Fox would be quite unusual for County Donegal to the best of my knowledge. If is one of those “angicisations” (synonym) for a few different Gaelic names. But you will mainly find it originating in County Offaly. Mike. That could account for my running into a dead end when tracing the “Fox” family tree. I was searching “Fox” in Donegal based on info from ggrandmothers naturalization papers. Regretfully, I do not have his parents name or any other family member. I do remember my dad saying he thought the name was changed (not by choice) when arriving in the US. Fortunately, I have had much better luck with my Byrne (paternal grandmother) family. So I do know where some of my roots were planted. Thanks for the info…. Patty – almost exactly right. BUT – both McCoy and McGee are forms of the Irish “Mac Aodha”. The McCoy family are mostly in north Ulster. Mike. When did the Bergin name first show up in Ireland? I was told that a book that is no longer in print said the name was in the Geashill area but I don’t know what time frame that would be. Hi Sue – the Bergin name – like many Gaelic surnames – came about sometime before the 13th century. They were always a clan but the surname system only came about from the 900s onwards. Geashill is in County Offaly – but the Bergins had moved mostly to County Laois. Mike. When do you expect this book to come out? Or in other words do you have a tentative date? I do genealogy and am from the Bergin and Scully line. My Scully line is a huge brick wall for me and the Bergin line even though I have more info on it I am only back to the 1798 time frame. I have an obit saying that my Bergin line was from Kings and I can’t seem to get it narrowed down from there. I would like to read your books and see what is says about the family lines to hopefully get a better understanding of how they moved around, so I am hoping your book is going to tell stuff like that. My family names are O’banion, Stoker, Thomason, and Welch– I know the first two originated in Ireland, but that’s about all I know of it… I would love to know more if possible! Thank you! Hi Sarah – O’Banion (also O’Bannon) from either county Offaly or Fermanagh. Stoker is an English surname that arrived in Ireland from the 1500s onwards – spread throughout the country but mostly in Dublin. Thomason – I don’t have on record. Welch (also Walsh/Welsh) is throughout the country. Came to Ireland with the Normans from the 1100s onwards. Means a person from Wales (where the Normans came from!). My ancestor Edward Sinnott, son of William Sinnott & Jane O’Neil , came to Gaspe.province of Quebec 1778 .. Hoping to find trace of this family one day..!! . Hi Diane – there were a clan of O’Neills down in the Waterford area – and of course, Sinnotts have been down in Wexford since the 1200s. Mike. My straight answer is – I don’t know for sure! The internet, and many books, are full of stories that people present as facts – and insist on them being correct. I think it is more useful to have an open mind – and be prepared to entertain a number of possibilities. Let me give you a couple of these possibilities – and you can decide which works best for you! “The McCartneys are a branch of the great family of McCarthys in Munster in the south of Ireland. The fifth son of Cormac Fionn McCarthy was Donogh Cartnach who is the ancestor of the McCartneys. Donough Cartnach left 2 sons, the eldest Donal served under Robert the Bruce’s of Scotland and received a grant of land in Argylleshire, called ‘Glen Artney’ from the King of Scotland in the 1200s. Some of Donal’s descendants later moved to Galloway. From there George Macartney emigrated to Ulster from Scotland in the 1600s. He is the original ancestor of many of the families of Macartney in Ulster and Ireland. He bought the property of Lissanoure in 1649 near Cloughmills Co. Antrim.” (source – Wikipedia). Now – wouldn’t that be a nice story to believe! “McCartney is cognate with the Irish surname McCartan. McCartan is derived from Mac Artáin, which denotes the son of Artán (Artan is a diminutive version of the surname Art) – and was the surname was taken by chiefs of Kinelarty in County Down. The McCartans belong to the Uí Echach Cobo branch of the Dál nAraidi dynasty of the Cruthin.” (source – Wikipedia). This suggests that a branch of the McCartans moved to Scotland at some time OR share a common ancestor. Now, I know I’m being a bit of a devil by suggesting that the source for both of these is Wikipedia – but you do need to be careful of what you read on the internet – specially on Wikipedia! So, back to Kenneths question: Which tribe do the McCartneys belong to? Well – they could have been originally “Eoghanacht” (McCarthys of Munster) OR the Dal nAraidi (which ironically were a Cruthin tribe who originally came from the east coast of Scotland!). Of course, when they travelled to Scotland they become part of the Clan Mackintosh. Hi Ana – Mulvihill = Ó Maoilmhiadhaigh = County Roscommon/Longford. Mike. Hi, my greatgrandfather, his brother & mother arrived in Canada from County Down about 1824 t work on building the Well and Canal. Is our surname Irish or Scottish? I am having difficulty finding any information in Ireland. 1. From the Irish surname MacDarragh – found in County Antrim. 2. From the scottish surname Darroch – this would also be found in County Down and Antrim. I’m doing some researchon my maternal grandmother’s line, surname Colgan. I found a court case in whiche it states that Bernard Colgan was born before 1797 in Ireland and lists his siblings as Andrew, John, Mary, Thomas and Kiernan b 1816 (my great, great grandfather). Bernard died in 1845, before our census records became more detailed. Any ideas on how I can find where in Ireland they were born? Hi Matyann – Colgans are usually from one of two different places – either county Derry or county Offaly. Offaly would have been known as “Kings County” at the time you are looking. Derry was known as County Londonderry. Mike. Thank you mike for the clarifation! I was leaning toward Offlay….will post if I find more info. Keep up the great work, this site is excellent! Hi mike this is my first time looking up my irish heritage I wanted to know id you could tell me where the name Mcafee would be at? Hi Remy – McAfee is originally a Scottish name found in County Donegal. All the best – Mike. Amos Stevens/ Stephens/ Stevanus born 1756 in above location, his father Alexander Stevanus about 1720 location unknown; Amos married Roseanna Bicomb of Moorefield Cross Roads. I have hit a road block, can you suggest where I can look. Are there any records from there that could help me? DNA has been done, I carry the Celtic gene. Hi Gary – for specifics like your request, I suggest you contact Noreen at http://www.hiberniaroots.com. All the best – Mike. Did you get an answer for your question? I have the same road block on my Tree, I have back to Moorefield Cross Roads, Galway, Ireland. I have Alexander being born ABT 1720 , married to an unknow Garrett. My immediate grandparents were_O’Donoghue (Newmaket on Fergus), Herrick, Farrell and Finner. I “inherited” boxes of Finner family history when one of my brothers passed away in 2012. The snag is that my great-great grandfather Benjamin Finner is listed as being born in England about 1795. His wife, Mary Mantil, was born in County Cork (1806). It has long been diputed in my birth family, whether Finner was originally Irish or English. My husband and I, were in Ireland in May, and found Finner Road Roundabout at Bundoran. Since we can’t find evidence of Benjamin’s parents, I wonder, if perhaps, if they might have been Irish. Hi Nora – I can’t answer for sure as I do not have any documentation on this being a name found in Ireland. My guess would be that it is a Planter name – but that is only a guess. Mike. I am looking for Brown’s and Montgomery’s. Can you tell me anything at all about locations where they might be? Are they Scotch, Irish and where to locate-I am just getting started-any help appreciated! Brown = Anglo-Norman name – one of the “Tribes of Galway”. Often found in Counties Galway and Limerick. Montgomery = usually a planter name in Ulster from the 1600s. All the best – Mike. Thank you for allowing me to join this page and allowing me to read all the articles. I find them very helpful. My family is based out of upstate NY. I am trying to find as much information as I can about our name as I am then able to make a christmas gift for my grandmother. My last name is Collett and my grandmothers name is McSheehy. I believe we were based out of Cork but that obviously is possibly just our leaving point . We are very proud of our Irish heritage. Any bits of information or links you may be able to let me know of I would greatly appreciate. thank you again for the acceptance, I do greatly enjoy reading everything. Hi James – good to have you here! The McSheehys were from Cork. They were originally a Galloglass (mercenary Norse soldiers from the Hebrides) who settled in Ireland after the 1200s. Collett I don’t know! All the best, Mike. Hello Mike, Thrilled to discover this page! My forebears are Wiley (Wylie), McGrath, Hartigan and Synott. The last 3 names seem to be fairly common in Ireland but the Wiley(Wylie) name is the one which I’m most interested. I know my gr. grandfather Robert and his two brothers & a sister all lived in Aghnahoo Glebe, Templecarn Donegal before they came to Australia in 1856 but have problems beyond that. Hope you can give me some advice. My first visit to the page so I’ll enjoy also finding what I can about the other three names. Thanks for your help (in anticipation). Hi Pam – great to have you here! On Wylie – this was an English planter name that came to Ulster in the 1600s. All the best – Mike. Four of my third great grandparents were born in Ireland and some of their descendants immigrated to Canada. Looking at your Tuadmumu information covering the counties of Clare, Limerick, North Tipperary, I see two names in the family (O) Hogan and Ahern. It also seems possible that Conrick and Redmond may have evolved from possibly (Mac) Conway and (O) Reddan ?? Anyways, it is nice to see that Tipperary might not be just a family story. Always looking…. Thanks for the info. I can never find my family name: Kealy on any Irish name lists, although I’ve seen photos of a pub in Ireland called “Kealy’s”. Would like any info about the origin, meaning and ancestry of the name. We live in central NY, USA. and are at least 4th generation American. Thank you! Kealy is one of those names that can be the English version of a few Irish names. It can be found in various parts of the country including Armagh, Laois, Meath etc. The Irish form can be “Ó Caollaidhe” or “Ó Cadhla” or “Ó Céile”. The best way to narrow it down is to find out more about where your relatives departed from. Hope this helps – Mike. I saw a version of my name in the Airgialla section. MacNally. We spell it McAnally. I know this is a stupid question but is there a difference and what it would be? Hi Carol – no difference – both from the Irish “Mac an Fhailghigh”. All the best – Mike. Mike, I know you mentioned it once before…can you tell me again where you think the Scottish Irwins settled in Ireland? We have family coming to Ireland next summer to try to find the area(s). Thanks! Best of luck in your new endeavor! Hi Nancy – the Irwins would have settled in various parts of Ulster and in County Roscommon. All the best and thanks for the best wishes. Mike. What a job you haven done! I know we all appreciate the time you have spent and I look forward to your book as well. I see that Finnegans show up in two parts of the island, are they different clans? Also, I’m a McCarty, which I understand runs with McCarthy who were from Kerry. Like most here, I sure wish they didn’t keep using the first names over and over. Sure makes finding families tough! Hi Lauri – I do like your point about first names, but it does make things interesting! Finnegans were different clans all right. On McCarthy – they were (and still are) very prominent in County Kerry and Cork. Thanks for the feedback and all the best – Mike. Hi, my grandfather’s side, Boyle, came from County Cork. There is a MacGill mixed in on that side, as well, that I know of. My grandmother’s side, O’Boyle(married my grandfather), is from northern Ireland part, in the northeast corner. I can’t remember the county. Hi Mike – northeast corner would be Antrim. The O’Boyles originally came from the north-west corner, County Donegal – where they shared the chieftaincy with the O’DOnnells. All the best – Mike. I still can’t seem to find the place location in Co.Cork, although I remember seeing it once in a history of the Sullivan’s…Berehaven. I think it was shaped like a peninsula? It’s where we came from to Nova Scotia. Hi Kathleen – if you are an O’Sullivan, that is probably “Castletownberehaven” (or Castletownbere for short) on the Beara Peninsula. That is the homwe of the Sullivan Beara clan! Mike. I have many Irish names in my linage, but I want most to start with my maiden name Houlihan. It doesn’t seem to be common and I think my family came from Dingle but I’m not sure. Any info? Hi Janet – Houlihan is quite popular in North Kerry with the spelling. Its one of those names that has a lot of different spellings around the country – but when its Houlihan, its from Munster! Mike. Thank you for that confirmation! Hi Susan – Acheson is Sottish name that has been in Ireland since the 1600s. It is scattered in small pockets around the country. All the best – Mike. For a name that is extremely numerous, my McBrides are taking a bit of tracking down. Mine were from Portaferry, County Down and I have traced back to my G.Grandfather, Archibald McBride, married in 1855. After that, I’m stuck, should I continue looking in Down or did the McBrides originate elsewhere ? Hi Edward – the surname McBride comes from COunty Donegal where it is most numerous. However! – when it is found in east Ulster (Down etc.) it can be of Scottish origin and therefore a Scottish planter name. That may be a useful line of enquiry for you. All the best – Mike. Hi! Thanks for the preview! I come from McHugh’s and Gallagher’s and your information further supports what I’ve already been researching for years. I have “Carson’s” on both my family lines. Some claimed Scotts-Irish descent while the other line claims only Irish descent and were from County Antrim. Any idea where the truth or middle ground lies? My only conclusions thus far is they’re originally from Scotland and made the fantastic decision to jump to beautiful Ireland. Any help is greatly appreciated. Can’t wait to get the book! Hi Lori – you’re welcome! On the surname Carson – that is a name of Scottish origin, but very numerous in Antrim since the 1600s. All the best, Mike. Hi Linda – to the best of my knowledge, yes. Do you have a Trotter ancestor from Ireland? All the best, Mike. Hey Mike, thanks to a friend on Facebook I found this, and its been nice to read and learn on some surnames. Fine job you are doing with all the replys and all. Now for my turn in asking a question about a surname, lol. When I was in high school not too long ago we had a project to do about family history, and through the asking of my relatives I found that in the 1800s I had some relatives come over from Ireland but thats the furthest back I can find, the name I was given was Kayo, know anything about that one? Hi Jerry – good to have you here! Kayo is a difficult one – it may have been subject to chinese whispers down through the years …. My best guess is that is is a name like Kee or McKay or McGee- all of these names from from the Gaeilc “Mac Aoidh” – which means son of Hugh. Do let me know if you get more information. As an Irish Callaway, I have often searched for my name. My Grandmother told me it was originally spelled Callaweigh…later I was advised that it was corrupted from Calbhaigh to MacCallabhaigh. Pleeeese, don’t tell me it is an English planter name- I will be forever heartbroken. Hi Reva – its normally anglicised as Calway in Counties Mayo and Sligo and comes from the Irish Mac an Chalbhaigh. 🙂 Mike. I found my O’Tracy name in your map above and now have come across a gr grandmother with the last name of MacHendrick or MacKendrick from Waterford Ireland. Would either of those spellings be on your list from the Waterford area? I have also been able to find Tracys from Hacketstown, Carlow, Ireland which I believe is a gr gr grandmother. When and from where did the Smith name originate from as that is a maiden name from the same area in Carlow. Will your book have information and links to assist with searches for our Irish ancestors? On the book – yes it will – but more in the way of helping you fill in the bigger picture of the surnames in your family and the places they come from. However, I will also include a list of other resources for more fact finding. Mike I know this is a dumb question but have you been to Cavan yet. I have been following you on facebook and so far I either missed it or you are not there yet. Getting back to searching again. Seems like family in US have been estranged for years and most are no longer alive. Hi Bettie – I have yet to feature much from Cavan as I have yet to visit for pics etc. Stay tuned! Mike. I will be very interested to see more featuring County Cavan myself! I have traced my Irish ancestry back to Miles Riley, who came to Virginia in 1637 as a surveyor for the English. He and his descendants were so prolific, I think I may be related to half the eastern coast of the U.S.! My dad’s family name was Grogan. He said they were from County Cork. Thanks for sharing Mike – now added to our list. The name Grogan was from Connaught but is now found all over Ireland. Mike. I believe my family the Heffernan’s came from County Clare and from what I had found out so far we are from the original Heffernan Clan. I was wondering if you could tell me any information on them. Thanks. Hi Mary – they were indeed from Clare, but moved further southeast to the Limerick/Tipperary Border where they were chiefs of Owneybeg for a time – and you will find many of them there today. All the best – Mike. Hi Terry – I have only added your Reid in the recent past. It will show up in later articles. Mike. I did not realize that my fathers family name of Field is Irish. Was surprised to see that and thank you. They all talk about being English and not Irish descent on that side. However, I did not see my mothers family name of Glynn listed. They immigrated to the US about 1860 or so…..I always thought they were from the western part of Ireland but some insight here would be helpful. Hi Deborah – Field in Ireland is sometimes of English origin, but often of Norman origin and sometimes a Gaelic name also – a real all-rounder! Glynn is McGlynn – it came from Westmeath originally by moved out into Clare and the western counties. Mike. Cassidy and Coffey from Cork and Roscomman. Unfortunately Grandfather ended up in a Brooklyn orphanage and we have little more than his parents names to go on. Its hard alright Roger – maybe time to get help from a genealogist. Mike. I pretty well expected to see MacHale in Connaught but never realized the name was of such early origin. Castlebar is the town where Mary Sheridan and William McHale lived before there emmigration to USA. Ballina and Westport have also been mentioned in family stories. I just wondered where it originated from?? Hi Mary – De Faoite arrived in Ireland in the 1300s from England. This map is from a time before that – we’ll have it in the next volume (its already in the present one but is located in England) all the best, Mike. This is what I’ve been looking for. I’ve been tracing our Surname Feighery (O’Fiachra) and this may help a lot! hi mike, very interesting. I am wondering if you anything about my second name. LORDAN or O’Lordain as it is seen in Irish. this name is never in any of the published books such as this and hardly any info is available on it.I know that you will only find this name in the west of County Cork, around the catchment of kinsale and bandon. Its first mentioned in the Eliz Fiants, where two bros of the name are pardoned. I have heard theory after theory on the name, that its a sept of the O’Mahonys, the O’Briens and no one can tell me for sure. I have my doubts that it is even an irish name, as I have found a similar name in spain, and reckon it might be spanish sailors that settled in kinsale/Bandon. I dont know!!! You are right about Cork, Jimmy – I just passed Lordans butchers in Ballinspittle yesterday. It comes from the Irish Ó Lordáin. Mike. My family names that came from Ireland were, Harbison, Griffith,McKiernan,Brennan, Scanlon, O’Donnell. The Harbison’s came from Antrim, Griffith’s were from Donegal. Not sure where the O’Donnell’s, McKiernan’s, Scanlon’s, or Brennan’s are from. But would love to find out. Thats the sort of question we deal with on our letter from Ireland Kristy – just sign up for free on this page and we’ll get you started. Mike. Mike just a quick question. According to the records I’ve read, my surname BERRY came from the Norman conquest of 1066. Another part says my surame comes from ÓBeara. Shortly after the English came my family followed them to England. Most of my family records are either lost or destroyed. Any help with this would be appreciated! Thanks bud. Hi William – yep, you are talking about the English name Berry there. 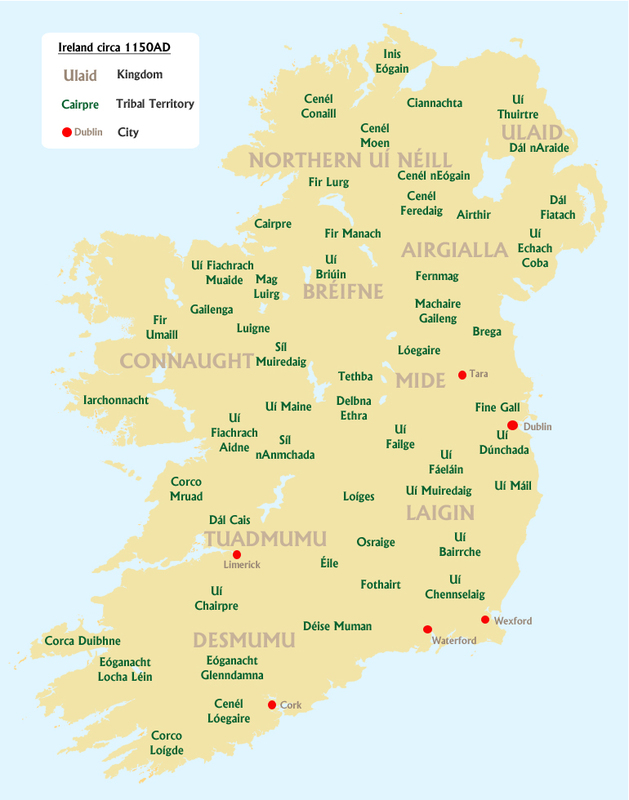 However – many English names were “pegged” to Irish names over the centuries. In the case of Berry it was mostly used for Béara – which is more often anglicised as Beary. They were from Offaly and were a branch of the Dempseys. Mike. I never see anything about our family name, Brannigan. I know they emigrated from Count Tyrone but little else. Where did they originate? Hi Bridgette – Brannigan comes from Counties Armagh/Monaghan – but at the time of this map they would have been part of the Cenel Eoghain. Mike. Hi there, I really love this and I just staryed getting into my familys geanology. My mothers side is easy they have our three main main family branches mapped out for centuries going back its remarkable, but on my dads side its a little more murky. That’s where Keating comes in and I know that my great grandfather was second generation here in America straight from Ireland and his family settled in Boston, but we really had no contact with much of his family and both my great grandparents died, so that lead is out. Where would I start looking for Keating since I didn’t see it on your map at all? Hi Ryan – the reason you don’t see Keating on this map is that they ghad yet to arrive in Ireland in 1156. Keating is a Norman name that arrived in Ireland in the 1200s and settled mostly in the counties of Wexford and Kilkenny. Mike. Hi Edward – well spotted – that was oversight on my part in this article (since corrected in the book). Dunnes were lords of an expensive part of modern County Laois. Mike. Hi, first of all thank you for everything that you do in helping us learn more about our Irish heritage. My ancestors’ surnames are Ahern, Barry, and Healy. Ahern and Barry are my paternal grandfather’s ancestry, and Healy is my maternal grandmother’s ancestry. I haven’t yet done research on the Healy name. I have some research to do here in the US first. I have researched the Ahern family back to my G-G-grandfather and they were located in Cork County. I am assuming that the Barry’s too were from Cork. I am enjoying doing the research and hopefully will be able to find information on my G-G-G grandfather (Ahern). Again, thanks so much for the information you provide. It is certainly helping me find my past! Take care. Hi Ann – thank you for letting me know! You are right about the Barry name. Regarding the Healy name, I wrote about it today in the Letter from Ireland. The Cork Healys were from Donoghmore in north Cork originally. Mike. My ancestors surnames that I have are Savage, Doyle, Welsh (or Walsh). I have been told that Savage originates from County Down, but cannot find them there now. The Savages came over in approx 1851 to the USA. The Doyle’s came over in 1870. I want to find more information on them in Ireland. Can you guide me in the direction to find information? Hi Bonnie – Savage was a Norman family that settled in County Down in the 1200s alright. Lots of them there even today. A branch is also found in County Cork. Doyle is typically from Dublin down to Wexford. If you are looking for help on specific family records for individuals, I suggest you contact Noreen at http://www.hiberniaroots.com – she should point you in the right direction. Mike. Sounds like you’re ready to go, Kathleen! Mike. Hi Mike, my surname (Kilkelly) is fairly uncommon so was half expecting it to be missing from above. Suitably impressed to see it listed. I’ve found it difficult to find info on its origins. I know it comes from Galway and believe we were linked to the O’Kellys. I also heard there was another clan called Killykellys. Not sure if there is any link there. Appreciate if you can shed some light. Where can I get hard copy of your book? Famous family in Galway/Connemara – Genealogists/Historians to the O’Flahertys. Killkelly and Killikelly are from the same Irish name. Not linked with the O’Kellys except for some Killkellys who took on the Kelly surname along the way. On the Tribes of Ireland book – only available as ebook. The “Letter from Ireland” book is available as a hard copy on Amazon. All the best – Mike. My Irish names are Hayes/Hays, Shea, and McCauley (lots of different spellings for this one). This is a great article and I’m thrilled to have found this site. Glad you enjoy it Susan – names added to list. Mike. Hi Mike, was just wondering about where in Ireland my family name is from, which is Galaway. I was told it’s a part of Ireland that is now a part of Scotland. And also wondering about my married name Gathright, where is it from. Any help wouled be appreciated. Love this site, wish I had found it much sooner! Looking forward to finding more about grandparents ancestors from Ireland. Links have been very helpful resources. Thanks for sharing your gift, Mike! My 6x-great-grandfather, Edward McDonnell, came to the US after selling the family farm (lease?) in County Kildare. From everything I’ve seen, including your map, the Mc/Mac/O Donnells came from the northern part of the country. I haven’t found any evidence of that name in the Kildare area outside of our family. Do you have any information on how they might have ended up so far from the rest of the clan? Thanks so much! I was absolutely thrilled to see the name of my Irish ancestor Turlough and the history to 882. I was sorry I did not get the first newsletter about him. My line also includes Cathal, and Roderick O’CONNOR. So hope I can find out more about my family. They finally left Ireland and went to Prince Edward Island, finally later settling in Kingston, Canada. My Gr. Grandfather was Durlan Thomas Connor (the “O” was dropped when they came over because of a fight with a priest over the burial of an infant daughter. The name of the ancestor was John O’Connor who had Aaron and Thomas as sons. Thomas named his son Thomas Durlan, and he named HIS son Drulan Thomas Connor. My Gr, Grandfather was 6 foot 5 inches. He married my Gr. Grandmother after meeting her at a friend’s house in Cincinnatus, NY. My Gr. Grandmother was terrified that when my Gr. Grandfather went back to meet family in Canada that they would not let him come home. He never was a US citizen, keeping his citizenry in Canada! My Mother was Mary O’Kane from Co Derry, her mother was Formerly Begley, from co Derry, and her mother was formerly McShane, also Co Derry..
My grand father O’Kane’s ancestors were Donnelly’s and McCanns, but the name is so numerous around Co Derry it is almost impossible to trace back with accuracy. My maiden name is Gormley. I have relatives still in Co. Tyrone although I believe the Gormleys originated in Donegal. I have a cousin whose maiden name is Boyle. When she got married, I wondered how her family considered themselves more of Scottish descent than Irish. Her father had been born and raised in Scotland. What can you tell me about Gormleys (I did read once that the Gormley clan was somehow connected to Niall of the Nine Hostages. Also, how did the Boyles wind up in Scotland? My Grandmother told me her relatives came from County Cork, Ireland. Not sure which ones but their names are McMahon and McMullen. Would like to know in what town. I know my Flatley ancestors lived in Claremorris, county Mayo, but other names in my family are McCabe who married Duane (then emigrated to Nova Scotia), Flaherty who married O’Mara, Coughlin or Coughlan who married Buckley, Duane who married Fagan , older Flaherty who married Cavanaugh. I put husband and wife together if that helps identify a location. Is Kerley an Irish Surname? It can be, but it can also be English. Hi My Maiden Nme is Sheen.. Any info you may have regarding the Sheen Family would be highly appreciated… Many Thanks.. I saw interviews where the Sheens are alleged to have tiger blood and are constantly winning. I’m new to your site but am really enjoying what you are sharing. Thanks!! I found there, York might come from county Langford. Any other leads? I am a Dibble do you know if they are from Ireland or are they likely from England, Wales or Scotland and where specifically? Same question for Soreghan and Stevens. I am proud of my Irish, Welsh and German heritage and appreciate your help to learn more. I always thought my family was from county mayo, but it says on here I’m from northern ireland? Anyway thanks for the info and if you have anymore on my last name, I’d love to hear it! I also was curious to if my family fought agaisnt the Brits or the vikings. Hi I am new here and am thrilled to have found your site. I have been trying to learn more about my 4th great grandfather who was born in Kilkenny Ireland and did not know how they spelled Olehy back in Ireland and when I saw the name (O)Leahy I knew I had to check this out, and if this is my families name hopefully now I can learn more about my 4th great grandfather’s history of his life in Ireland. Very interesting Sandra – O’Leahy comes from across Munster – specifically Cork, Kerry and Tipperary. Mike. Mike – I have posted in the past but not sure I got an answer. Can you help me with the following surnames? Kelledy – my grandfathers name – they lived in county Louth and Meath until the early 1900’s. Looking for the origin of their name. I have seen several references O’Callada as the Irish origin. Grimes – my grandmothers maiden name. I believe her ne origin is Norse. The last is Rogers… Also supposed to have Irish origin as McRory or Mac Raudri… And grand dad days from county Cork. Any help would be greatly appreciated. My wife and I just spent a week in Drougheda trying to get started with my genealogy. We intend to come back this summer to kick around a little more. I knew our name (O)Doherty was from the original tribes in Ulster in reading your first book. It is interesting to see it here in the Irish. Can you tell me any more of the Doherty clan? That was very informative and interesting. Thanks. My family surname is Fennessy and usually very difficult to find information about, so this was very helpful. Other family names are Joyce, Hegarty, Brennan and Noonan. I didn’t see any mention of Joyce or Noonan. Do you have any information on those names? Is there anything you know about the O Caoimh’s or the O’ Keefe’s? I don’t see one of my family names, Delaney, on here anywhere. Anyone know anything about the Delaneys? My grandmothers maiden name is knee I found references to it but really interested in a little more knowledge. I am a descendant of the Ahern’s from Kilbrittain, Co. Cork, and the Quigley family , from Silvermines, Co. Tipperary. I know the Quigley family originated in Mayo county, and migrated to Tipperary, for reasons unknown. Was wondering if you had any information on either the Ahern or Quigley last names? Would like to know my GGmothers Byrne origins. I know she came from County Wicklow specifically I believe the town of Ashford. My GG John Stone, name changed from Pertinstone supposedly came from England??? My grandmother’s name was Elizabeth Byrne Murray…Would love to know the origins of the Murray name…I read your map of aprox 1150 AD and see that you have several Murray families listed in Connaught and a MacMurray family listed in Breifne (Leitrim, Cavan, Sligo) area…there are none in Northern Ireland at that time…I believe that many came over from Scotland.. Looking for Foley’s. Have a small clue that they were in Roscommon, but not able to find them…..
My 3x great grandfather was Charles Maloy, b.1795 in Kings Co (Offaly), Ireland. He is said to be a descendant of “John Malloy-of-the-Red-Gate”. Do you know anything about the “Red Gate”? Amazing site to aquire Irish heritage info..Im trying to link Quillans McQuillans Quillens McQuillens I know there is a link to Dun Luce but I wont be Quillan’d to all I read….I did read that the names had evolved over the years as well abreviated in some cases to son of Quillen Quillan etc etc..Any idea if its all the same clan from back when? I recently found out my family are from Ireland. Our last name was originally MacMahon but was changed when they moved to the United States. Our last name now is Mack. Where would be a great place to look further into this ? Hi Derrick – the MacMahons came from 2 different possible sources – County Monaghan or County Clare. Mike. I’m sure Mike is the expert. Thanks for this info. My McMahon family came from County Armagh, upper Creggan, in the 1810-1850 timeframe, before coming to America. I descend from Clans: O’Fogarty, O’Boyle & O’Hogan. My 2x great grandfather, Denis Fogarty immigrated to Ingersoll, Ontario. I believe his father was Michael Fogarty (County Tipperary?) married to Margaret Hogan. Are you familiar with any of these family lines? So glad I found your page. Trying to read all I can before my first visit next week. My paternal grandmother was a Winston from Ballinlough Roscommon. Where did the surname Winston originate? I’ve never been able to locate my paternal grandfather’s lineage in Ireland. He is a Collins, born in 1895 in Maryland. It appears his father was a first generation American and his mother was a Costello who arrived in 1884. What area of Ireland should I center my research on? Not entirely sure, but Winstons appear to have forfeited estates in Tipperary and Waterford presumably in 1690’s and early 1700’s. Hi. I was wondering when the surnames Mccrossan and Quigg came to Ireland? Do you have any info, or could you direct me to info, on the Hanagan family name? Thanks! I am descended from the Conroy Family of Galway. I know the family prior to coming to the US lived near the Bay. I was contacted by a researcher in England who believed that The Conroy family could have had Viking heritage. I found that that a member of the Conroy family was referred to as a sea-king which I believe is a Norse term. Any thoughts on this? Just wondering where the Heagney’s originated? Heagney is my maiden name and different members of the family have different ideas where we came from! My branch came to Australia in the 1850’s. I have Coughlan’s in my family history and I noticed in the list there are both MacCoughlan and O’Coughlan in separate places. Is there a connection between the two and would I need to trace it back myself to see where and when the “prefix?” was dropped? I’ve just started looking into our family history and am getting a bit bogged down. Seems the current family names are the same as the ancestors names. I’m specifically trying to find Maria (pronounced Moria)Fares who married Samuel Watts and emigrated to Canada just after the turn of the 1900’s. Maria came from Ireland but no one in the family knows where she was born. Perhaps you can help me. I have read the registry above and was not able to find our family name from Ireland. I know that several names over the years were change from the Mc, Mac, O, etc. as the prefix. I am not sure whether this would apply with our family name or not. Our family was from the above Dublin I know. My great grandfather had come to America and had served in the Army during the time of Chief Joseph, if the family story holds true. Then I got another message from one of my sisters that he was again in the Calvary with a corporal status. I’m looking for the names Moore, Borland and Barnabee but can’t find them here. Do you know of those names? My Moore line is from Cavan. we know that most Keohanes come from County Cork, but….is it really an Irish name or where does it originate from? Any informagtion would be appreciated. thanks a lot. Great map and as always I search for anything remotely connected to MURDY. I have come to a dead end with my Murdy roots which show up in County Cavan, Killashandra area and possibly Ballykelly, Londonderry in the 1700’s. Murdy is not a common name and I do realize the evolution of surnames, just always hope to see it on anything historical I read or search. I cannot confirm what name it came from or tribe. I have a feeling it comes from Scotland into Ireland. Do you have any thoughts on this, most appreciated it you do! My Great Grandfather Charles McVey was born in County Tyrone 1843 is the McVey name associated to that County…………I know that they were travellers . Just read this info and wondering where Fermanagh fits into the tribal areas? trying to find from where our family came. The name is Monaghan/Carrigan Ancestry first shows it coming from Ireland in early 1800. Before that They didnt say. I think another version of it may be O’Manachan or Monahan. Any Thoughts? BULGER/BOULGER/BULGIER – I can’t find these names anywhere in Ireland. My folks supposedly came from Antrim in the late 1700’s or early 1800’s to America. They are lost after america. Why can I not find them. From the records I have found, Michael William Bulger came to America in 1775. There are a few books written that state that Michael came from Ireland with his brother John, and was involved in the Rev War. In Owens book, The story of Alabama, Vol. 5, is found the statement: MICHAEL BULGER, BROTHER OF LORD JOHN BULGER OF IRELAND, CAME TO THIS COUNTRY WITH BARON DEKALB TO ASSIST THE COLONISTS IN THE REVOLUTION, REMAINING A MEMBER OF HIS STAFF, AND WAS AT HIS SIDE WHEN DEKALB WAS KILLED AT CAMDEN, S.C. In 1798 The State of South Carolina granted Michael Bulger a tract of land in the Washington district containing 500 acres. Name I am looking for is McGaughnea. I cannot find out where in Ireland it comes from. All of the answers I get is Not found. Can you help me ? I am at a brick wall. Thank you. No Sullivan or Sheehan listed?? Fairly certain both families were from Northern Ireland. Do you have any knowledge of the Dorroughs? Where they came from? My 10th g-grandfather was Abner Dorrough who left Dublin in 1702 for the United States. He was born in 1680 but I don’t know where. possibly Dublin or surrounding area. In my website, I have documented our 4 foreparents lines as far back as possible. The Irish name search is McKeown. A cousin Donal McKeown has done the major work. He has 4 possible siblings back to Co. Armaugh in the 16oo’s. I can make you a member of this tree if I can get your email. TX!!! Hello. I am just fascinated by my Irish ancestors.. what I have found so far: TANGNEYs, mother is a CALLAHAN, there is a RONEY (married Callahan), and LENNON (ggrandmother) Any info always appreciated. My question is in regards to my maiden name, Loghry. It was originally Loughry. We pronounce it now – Log – ree, however ,it used to be Lock – ree. My ancestor originally immigrated from Ireland in the 1740s. I was told that we are”Scotch – Irish”. I understand that means our ancestors first immigrated from Scotland during the plantations in the 1600s. The name appears to be gaelic. Right? Assuming so, that would mean the Loughrys were Scots – gaelic ? Could you confirm this and \or tell me more? Heather – Loughrey is an Irish Gaelic name from around Mayo. I’d say that your family may have been McCloughry – a family name in Donegal of Scottish origin. Mike. I think my last name, which is Bryant was changed in England, which could very well have originally been Briant or O’ Brian. Not sure as to what territory they were from. Wondering if there is any insight on my name, Bryant. I know that the original spelling for McElhaney is Mac Giolla Chainnigh. But I have never been able to find where the McElhaneys can be found in Ireland. My great-grandfather immigrated from Scotland but his parents were listed as born in Ireland. I do believe his mother was a Kane. Other family names are McHugh, Dwyer and Black. I would love to know more of what you know of your heritage. I descend from a John McElhenny who immigrated to the United States (the Centralia Pennsylvania area) in the late 1840s with his brother George. They seem to have a lot of connections to the Blacks, Buchanans and Cheatleys who also came to Centralia, many of whom were from Letterkenny, Donegal. Unfortunately, I’ve not yet been able to find anything concrete linking my McElhennys to a specific place in Ireland…just an abundance of circumstantial evidence. I’d also love to find the family tartan and other info. Hello, My daughter is in 5th grade doing a heritage report. I was wondering about the last name Laffert. I’m not sure about the spelling, but this was my a surname on my mother’s side of the family who supposedly emigrated from Ireland to New York, but I’m not certain when. Any information on this name would be most helpful. Thank you! What a great site! I have searched since 1986 for my Mullen ancestors. I know that my gggrandfather, Patrick Mullen was born c. 1824 in Ireland (brought with him from Ireland or married his bride, Bridget Cummings on ship). He and his brother Dennis (c. 1830…met his wife in New Jersey and stayed a yr there) came over together. Brother “Wild” Bill, came over before them believed born before Patrick). Brother Lawrence was born Jan 1840 and sister Hannah born in 1837, all in Ireland. Parents were Lawrence and Ellen (Fearon/Ferrin) Mullen, born Ireland. For all accounts, we know there were also two brothers named John and Thomas (he never left Ireland that we know of) and two more sisters named Bridget and C/Katherine. The ONLY thing we have handed down is “they CAME from County Galway, Ireland and the family *farmed/lived* on an estate called either Briefield or Brierfield.” OH…some of them were very musical and played guitar and violin and they were Roman Catholic. That’s it. That’s all I can find, going back. I have TONS in the states, but, I just cannot get back to Ireland. I’ve searched for so long. I still find it hard to imagine that NO ONE is looking for any of my ancestors to put into their own family tree. *Through Family DNA…we do know that my dad descends from Niall of the Nine Hostages, as one of his blood lines. Thank you for all that you do and for the wonderful history that you share. I have recently learned my G Grandmother’s name was Honora Malloy, married to Bernard or Barney Cullen, my GGrandfather. Trying to trace my roots before a long awaited trip to Ireland. Hello. Trying to find something about family name of Mines. My great grandfather came to Ellis Island from Bainbridge Down, Ireland. Thanks. Upon looking at the list of names associated with each area I am assuming that my family must of had another surname than the one they used in America. Thomas and James Alexander Keown came to American in 1775 and 1776. County Down is suppose to be their home. Looking for Roche out of County Tipperary in 1840/41 to Lambton County Ontario Canada. The father Dave Roche had already died as well as some children. The mother, Hanorah (D”Arcy/Dorsey) born 1801 in County Cork, immigrated with her remaining children. Don’t know what parish they came from. My Mom thought the Roche name may have originated in France. In Canada the name was pronounced Roach. Do you know the background of French connection to Ireland? Just found a part about the Normans. I haven’t explored the ancient Ireland much yet. Found that Roche was a Norman name. Thanks for your site. Enjoying it. Unfortunately, our family doesn’t know the family parishes of our Irish ancestors. Rogers/County Longford, Roche/ County Tipperary, Lewis/ County Waterford, Burden/? County Longford?, Murphy/County Roscommon, O’Hara/Hoare/ County Cork?, Moore/ County Carlow, Ryan/ County Carlow?, O’Shea/Waterford?… As you can see, quite a few Irish ancestors. My Irish ancestors who departed Ireland for Canada and the USA left in the 1830’s(Richard Lewis and Bridgit Shea for Canada), 1840’s(Hanorah (Dorsey)Roche and her son John for Canada, 1850’s Patrick Moore and Margaret Ryan for Ottawa Canada area and in 1860’s, Patrick Murphy and Margaret Hoare/O’Hara for Mason County Michigan USA. You are inspiring me to think I can break the brick wall on these ancestors. My McDonald ancestors came from Scotland to Canada in 1786 and in 1856 married into Irish ancestry. Research helped me find my Scottish roots… it took a few years… I would love to have the same happen with my Irish roots. Your site is very encouraging. I am a person just beginning to trace my father’s ancestry back…ROE. And I really have to start from as recent as my grandfather, as I have really no handed down genealogy. I only know that there are Roes in Ireland, England, and I think perhaps even Scotland and Wales. Ran across your site and am hoping to glean some help in even tracing the origin of the name from the beginning. Thank you for all the vast information you have accumulated on this site. I am of Scot/irish heritage, mostly irish per DNA. I was told all my life MAC was scot and Mc was Irish. I am now confused. On my paternal side I was told I was pure Scot, McConnell, McFarland, MacNamara,Stewart, but as I searched back they became irish. My grandmother was Mcdaniel/ Renfroe and she said she was irish. My grandfater, paternal, reminded me of a little irish gnome, but insisted he was Scot. Although his grandfather came to NY from Ireland/scotland. Now, I did find they almost all that I could search came to the USA from Scotland and England. I can find records of the Stewart side, grandfather being born in Bala Castle Scotland, but I have no scottish dna only irish, Addison and Foster were from England to US but before that???? What do you mean by DNA? The highland Scots and the Irish Scots were the same family. Did you do Ancestry DNA? And were they able to be that specific as to say Irish rather than British Isles? Surnames have ‘bled’ over from one country to another. Macs and Mcs. As with my Hall line, a surname screaming ‘I’m English’ traces directly to Clackmannanshire , Scotland 1603 at trail’s end so far. News that my Scottish neighbor refused to believe before studying the records to confirm. Now am wondering if my surname, Barrett, had a vowel dropped from the end. Changing IT from English to French/Spanish/Italian. Lots of rules broken with surnames…maybe all names and all rules. Thank you Mike, for all this work!! My Mother’s surname is Collins, and I can’t see where it comes from. Any ideas please? My Father was an Egan, and I am slowly tracing it back. I just happened upon your site and found my surname listed under Connaught. Is there a specific place name family seat for Quigley? I have just begun to research back to Ireland, where my gr,gr grandfather came from in early 1800’s, dob about 1810 and we have no info prior to his coming to America. Greetings from Long Island NY. My son in law has the surname Irish. But it seems to a French name. Have you ever heard of it as an Irish surname? My own family Brennan is from Kilkenny City and my maternal grandfather is a Browne from Galway. Other family names are McCarthy and Doheny all from Kilkenny City. Jerpoint Abbey Irish Setters. Happy St. Patrick’s Day and the 100th Anniversary of the Uprising. I only have one Irish ancestor and that was Jacob Reath who came here around the time of the famine. I have now Idea where he came from and he may have been Scots-Irish. I don’t see my Irish ancestral name in any of the lists. My many great grandfather Joseph Scott was Irish. He was said to be Black Irish and he married a Lace Curtain Irish lady. The emigrated to the US before 1780. Looking for any information on Shannon family from Northern Ireland? Thanks for all the information you provide. We just signed up recently. The surname we are researching is DEVLIN from Londonderry. Decades ago we read a genealogy that claimed Devlins were sword bearers for Clan O’Neill; current DNA goes back to Niall of the Nine Hostages. We also learned somewhere that Devlin originated in County Cork. Still trying to find parish in Londonderry that immigrants John Devin and sister Bridget Devlin were from, children of Patrick and Bridget Henry. Some of my surnames which might be Irish are HEFFERNAN, MAHAN, DONATHAN, WARD, DUNN, LONG, MACMAHON, BRANTHWAITE. IFERNAIN. I have been told that the Carroll surname has origins in Birr which I visited recently hoping to turn up something on my ancestor Michael Carroll. Each person I spoke with regarding Carroll origins had something different to say. I met 2 from Dublin, another told me he Carrolls were from Leister. I have read at one time they were the high kings of Munster. Can you shed any light on the concentration of Carroll surname in Ireland? Your newsletters are so interesting!! Thanks for the opportunity to learn more! I find it a bit deceiving to look at the above information because I have been lead to believe that my surname: Slattery was an early family name (before 1100 AD) from Ballyslattery (Newgrove today) in Upper Tulla in the NE area of County Clare, but according to the info above, it is not mentioned??? Please give me some incite and thank you. Hi, I have a question. My acestory was done for my father’s side but only to 1720. My ancestor’s name was John Samuel Bailhache Black, born 1720 in Belfast, Antrim, died in 1807 St. Ouen ,Jersey, Channel Islands. How can i find what clan i belong to ? Good evening Mike, could you please send me any kind of information about my surname, is Galain. MCGEOGHEGAN…..as I understand it, clan names develop from notable members with whom relatives want to be associated…..so, what’s the story with the first GEOGHEGAN? I was interested in reading about the possible originality of how some of the name’s were possibly from other sources . I am interested to know if the name O’Flaherty is / was an original Irish name. Can anybody enlighten me please. I was told we have some Irish in our family but not sure. Was also told our name was also change. Our name right now is Points. My father says it was change from Pointer but I can’t find any evidence anywhere. But I did come across where two brothers came from Ireland and they change their name from Poyntz to Points. Could the name Poyntz be any where in ur records. Appreciate anything u can help me with thank u. Lots of reading here. I’m on a mission to backtrace a Toomey who immigrated to N. America in 1854. And a Doolan also, same year or apprx. John Joseph Toomey and Martin Doolan who ended up having grandchildren in common. One each of their children married in Louisville, Ky in 1901. John Joseph Toomey, Jr. and Anna née Doolan Toomey. Anyone searching for either or both surnames? My friend may be visiting Ireland soon with her clan. Since she lost her mother before old enough to have a memory of her, want so much to give her a direction on where her four Irish pond crossing g’grandparents are specifically from. My mother’s name is Lancaster. I know it’s English, but we think, from some records, that her family may have migrated to theUSA from Ireland. Do you know at what point the Lancasters wound up in Ireland and why? And who the first settlers were? My surname is Vanderver as it’s spelled presently. I took the DNA test for Ancestry.com and it turns out I’m not mostly Dutch. I’m 43% Irish and 26% Scandinavian. I just can’t seem to find my Irish connection. Hi, great information here. Have you seen anything leading to the history of the Dillon Family? I know about Lucas Dillon, but only found limited information on his origins. Any direction would be most appreciated. Inot your research also did you find anything about older castles? The derelict castle of the Dilllon’s I visited but was wondering if anywhere there would be drawings or pictures of that before it was derelict. Plus what happened to the family living there? My Grandfather was Michael Smith Born 3-3-1896. Died 29-06-1982 He was from Cavan , son of Patrick Smith who was married to Bridget Lynch. I am trying to trace back family to Irish History & see if he had any brothers or sisters ! Any help would be very grateful. any info on the name patterson or cussane? My Mother’s maiden name is McGee. The family is from the Tipperary area. I have recently done the DNA test. My Irish percent is low even though I know family so far date back to 1782. (Hoping to get further back) The test results show high for Scandinavia. Wondering if you know how I can dig into this. Thanks for your time. Looking for information on Great-great grandfather, Ambrose Boyle. He was born near the head of River Shannon,near the town of Boyle, in 1807, and migrated to Canada in the mid 1880’s, and ended up in Prince Edward Island. We would love to be able to connect with his ancestral line, and also have contact with any descendants. We have a lot of genealogy for our family, and cannot get any further back then him…..just thought it might get us some type of lead….he had a sister Eleanor, and two brothers, Thomas Sr, and Arthur Sr Thankyou for any help you can give, and a good day to you. Lets be clear wthout the anglo norman slant and bias that pollutes munster and its capital Cork..
Turlough O’Connor was father to the last high king Rory from county mayo. His clan remnamts are now spread out to galway. Roscommon and sligo….. the direct bloodline descendent is living in the uk and comes from the rescommon branch…. you should make a better distinction of the anglonormans from the irish. .. they played both sides and were the traitors brought in by mcmurrough that ultimately and definitively stabbed the gaelics clans inthe back at the battle of kinsale…. Statistical fact… cork was the norman capital and has today the highest number of french related surnames (not including your own respectable gaelic irish surname) Gaels abú! I visited Ireland in 2012 and absolutely fell in love with her. My husband and are planning a return trip there next year. I’m interested to know if any of my relatives surnames could have come from Ireland. Names are Keys, Ryan, Hunt & Gumm. My mother’s paternal great-grandmother was Mary O’Laughlin who married Issac Jolliff in Union County Ohio. I attended the Jollliff family reunions as a child and remember all the freckled red heads in the family gatherings. Issac and Mary have 5 daughters and 4 sons. How can I find where Mary came from in Ireland? A good place to start is with johngrenham.com and then we assist lots of these searches in our Green Room when you want to move further along with your research.